Home > News > WUCAN @ Muskelrock 2019! 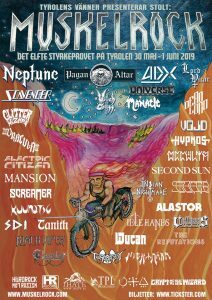 WUCAN have been confirmed to appear at Sweden’s most notorious underground festival Muskelrock! This will be WUCAN’s second appearance at Muskelrock after debuting at the festival in 2016. WUCAN have recently completed a European tour with The Vintage Caravan and have issued the single Night To Fall.